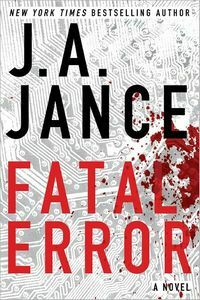 Fatal Error by J. A. Jance: Synopsis and Online Purchase Options. Synopsis (from the publisher): Ali Reynolds begins the summer thinking her most difficult challenge will be surviving a six-week-long course as the lone forty-something female at the Arizona Police Academy — not to mention taking over the 6:00 AM shift at her family's restaurant while her parents enjoy a long overdue Caribbean cruise. However, when Brenda Riley, a colleague from Ali's old news broadcasting days in California, shows up in town with an alcohol problem and an unlikely story about a missing fiancé, Ali reluctantly agrees to help. The man posing as Brenda's fiancé is revealed to be Richard Lowensdale, a cyber-sociopath who has left a trail of broken hearts in his virtual wake. When he is viciously murdered, the women he once victimized are considered suspects. The police soon focus their investigation on Brenda, who is already known to have broken into Richard's home and computer before vanishing without a trace. Attempting to clear her friend's name, Ali is quickly drawn into a web of online intrigue that may lead to a real-world fatal error.